Sometimes random books show up in my mailbox. Sometimes I'm really excited. I've been a fan of Cecil Castellucci's for a while (see Rose Sees Red review), so when I received her latest book without even asking for it, I was pretty psyched. This book is both similar to and different from Castellucci's previous work. The main character feels out of place, like he doesn't quite belong, until he meets another loner and makes a connection, just like Rose and other characters from Castellucci's past books. But First Day on Earth has a bit of a twist--Mal feels so out of place because he was abducted by aliens as a young boy. Ever since then he has wanted to find a way back, thinking that perhaps out there in space he can find the peace he's needed all these years. When he meets another teen, Hooper, at an abductee support group he comes closer to his wish than ever before. 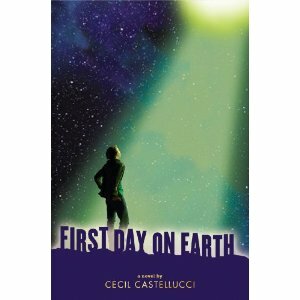 Although this has a science fiction edge, First Day on Earth, is very realistic as well. Even without the abduction Mal's childhood was less than ideal--his father abandoned them when Mal was just a little boy and his mom sank into a deep alcoholic depression. He's been on his own emotionally for years and it's not surprising that he feels more of a connection to an alien experience he can barely remember. Mal finds a kindred spirit in Hooper, another lost soul, and also connects with a girl classmate who seems to have an easy perfect life but has secrets of her own. These connections help Mal realize that maybe life on Earth isn't such a bad thing. First Day on Earth is very short, some of the chapters are not longer than a sentence, and will appeal to boys as well as girls. Readers who are not fond of science fiction should not overlook this book. It's not a sci-fi book, but rather a realistic fiction book or "problem novel" with a sci-fi twist.